Few winter-time pleasures are more basic (in a good way) than a cup of hot cocoa — although if you’re sipping on something that started as a powder, you are missing out. Making hot chocolate from actual chocolate is neither difficult nor ingredient intensive, but the rich, luxurious results will shame every last packet of Swiss Miss sitting in your pantry. Below are three recipes for at-home, made-from-scratch hot chocolate, two simple and one a bit more complicated for the more ambitious among us. The key for each, though, is to start off with high-quality chocolate. Do that, and you’ll never use a powder again. Despite having only two ingredients — just dark chocolate and water — this recipe is not for the faint of heart. The purity of the combination makes for an intense, decadent experience that those accustomed to traditional cocoas might find too rich. Cookbook author Megan Giller got this recipe from Aubrey Lindley, co-owner of cult chocolate shop Cacao in Portland, Ore. She recommends it as a way to try different kinds of single-origin or blended chocolates, because the water base won’t distract from their flavors the way a milk or cream base would. Bring the water to a boil in a small pan. Remove from the heat and add the chocolate. Cover and let sit for 30 to 45 seconds. Whisk gently and scrape the bottom of the pan with a rubber spatula to make sure the chocolate isn’t stuck to it. Put the pan back on the burner (keep it turned off) and let it rest until the chocolate is completely melted, 2 to 3 minutes. Whisk vigorously for a minute or two to emulsify completely. Check the consistency by seeing if it sticks to the back of a clean spoon. If it is lumpy, keep mixing. If it sticks and is smooth, you are finished. Don’t confuse bubbles for clumps; small air bubbles are OK. Some bits of chocolate will stubbornly remain at the bottom of the pan, but don’t worry about them. Serve warm. The flavors and texture will evolve as it gradually cools and rests. For those looking to make easy hot cocoa again and again, or who just like a milder beverage with a milky base, this recipe is the one for you. Make the sauce once, stick it in your fridge, and use it over the next few weeks at your leisure. Nate Hodge, co-founder of Brooklyn’s luxe bean-to-bar Raaka Chocolate, recommends 2 tablespoons of sauce per cup of warm milk or milk alternative, although you’re free to add more (but probably not less, let’s be honest) as you like. From The Art and Craft of Chocolate by Nate Hodge, forthcoming in 2018. Put the water and sugar into a small saucepan and put on medium high heat. Allow the liquid to come to a boil. Keep it at a boil for 5 minutes. Cut the heat on the stove, move the pan to a cool burner, and slowly mix in the chocolate with a whisk. Mix until the chocolate is fully melted and the mixture is smooth. Pour into a jar and allow to cool. If kept in an airtight jar in the refrigerator, the sauce should keep fresh for 3-4 weeks. Add 2 tablespoons of chocolate sauce to a cup of warm milk or milk alternative. To jazz it up, grate an ounce of dark chocolate on top using a microplane. 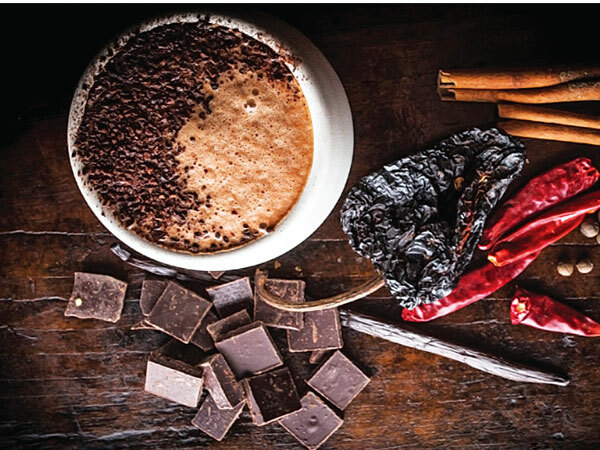 This more advanced recipe from Dandelion Chocolate is an homage to San Francisco’s Mission District, where Dandelion has its cafe and whose Mexican American population has made the neighborhood a center of food, culture, music, and murals. Spicy and rich, it could be its own dessert course and adapts particularly well for vegans. Simply replace the nonfat and whole milks with unsweetened almond milk. Dried pasilla chiles can be found in the Latin food section of your supermarket or in specialty shops. Combine brown sugar, cinnamon, allspice, cayenne, and pasilla in a small bowl, whisking to combine. Set aside. Using a paring knife, gently slice the vanilla bean in half lengthwise and scrape the beans from the inside of the pod using the back of the knife blade. Set seeds aside. Heat the nonfat milk in a very large heatproof bowl set over a pot of simmering water. When milk is steaming (hot to the touch), add the chocolate to the bowl. Whisk chocolate and milk mixture together until the chocolate is fully combined and the ganache is thick and shiny. Add the brown sugar spice mixture and vanilla bean seeds to the ganache and whisk until incorporated, continuing to heat the mixture over the pot. Add whole milk to the ganache, whisking to combine. Heat hot chocolate for another 5 minutes, whisking occasionally, until steaming. Remove bowl from pot and serve immediately. Dandelion recommends chocolate from Madagascar, but any naturally tart or fruity chocolate will do. Just in case you or your loved ones are not the hot chocolate types (gasp! ), this cookie serves a similar purpose. It’s rich, it’s delicious, and it’s best savored slowly (good book optional). Thanks to their large size—only 8 cookies on each baking sheet—and their dramatic, gooey centers, think of it as a cup of hot chocolate in cookie form. Just be careful not to overcook, which will ruin that fudgy center. Preheat the oven to 375°F (190°C). Line two baking sheets with parchment paper. Melt the chocolate wafers and butter together using a hot water bath or the microwave oven (see Note: Melting Chocolate, page 51). Stir until completely melted and smooth. Remove the bowl from the water if you used a hot water bath and set aside to cool. In a small bowl, combine the flour, baking powder, and salt. Set aside. In a large bowl, with a hand mixer, beat together the eggs, sugar, and vanilla until pale yellow and slightly thickened, 2 to 3 minutes. Stir in the cooled melted chocolate mixture. Gradually stir in the flour mixture until just incorporated. Cover the dough with plastic wrap and refrigerate for at least 15 minutes, or up to overnight. Scoop 2‑inch (5‑cm) mounds onto the prepared baking sheets, leaving 2 inches (5 cm) between the cookies; the cookies will spread as they bake. Bake for 12 minutes, or until crusty on the outside but soft in the center. Leave the cookies on the baking sheet for 3 to 5 minutes to firm up, then serve immediately. Store cookies in an airtight container at room temperature for up to 1 week. Reheat to achieve the molten chocolate gooeyness by microwaving them for 10 seconds.